Did you know that June is Child Vision Awareness Month? 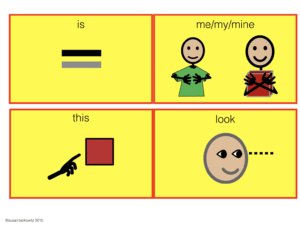 Vision is important for all students, of course, but it is especially important for students who are nonverbal or minimally verbal, and who need to use alternative modes of communication; such as pictures and/or text. 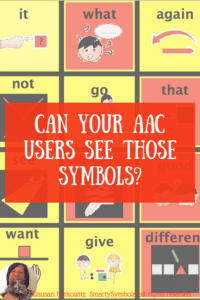 Augmentative communication users with vision impairment have an extra hurdle to jump. Vision, more than any other system, allows the individual to take in massive amounts of stimuli from the environment for the brain to act upon. In the process, the individual gazes at things, does so in specific sequences, and focuses on specific details in order for the brain to make decisions about what to do. What is Cortical Vision Impairment? CVI is a neurological visual disorder. It results in unique visual responses to objects and people in the environment. A child with CVI may see a world full of colors and shapes with perfect acuity, but he may not have any idea what he is seeing. The student may not make meaning from the visual images and may not know that the colors and shapes are a car, a hat, or his mother. There are some things we can do to help. 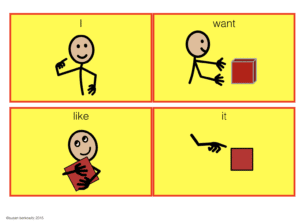 Providing movement, high contrast color, and bright colors that the student can distinguish more easily are all helpful. In Augmentative Communication systems, we use high contrast colors, a black background, a red flashlight hovering over the symbol. 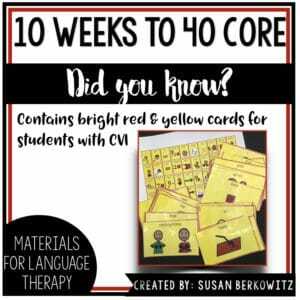 In my “10 Weeks to 40 Core Words” resource for beginning augmentative communication implementation, which provides activities for learning the 40 core words used in the Developmental Learning Maps, I include large symbol cards and a core word communication board in bright red and yellow – the 2 colors most often preferred by students with C.V.I. Here is a sample of the 3X5 cards. Just right click and download, or drag to your desk-top. 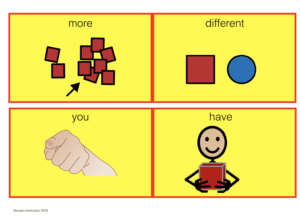 There are 12 core words in this sample, which is a good starting point for your Augmentative Communication users. 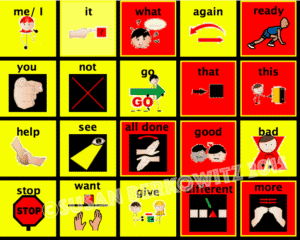 Use them in a wall chart, velcro them to a wall, or use them as a beginning communication board. Keep on talking! I have been a SLP for more than 40 years, working in public and nonpublic schools, nonprofit agencies, group homes and day programs, developmental centers. For the past 20 years I have run my own private practice, providing independent AAC evaluations, consultation, and staff training. I have presented full and part-day seminars and workshops, spoken at national and international conferences, and published research in peer-reviewed professional journals. 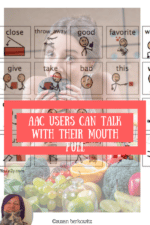 I currently create AAC implementation materials on TPT.